New Year’s Eve 2019 is upon us, the wait is over! The most eagerly anticipated night of the year is finally here. London city can’t wait to blast with lights, colors and firecrackers. Where are you planning to spend this blissful night in London? We know that you have been waiting for this night! It’s finally here, NYE 2019, it’s going to here in just a few days. As we know how important this night is for you, we would like to help you find the best places where you can experience the best New Year’s Eve 2019 parties. The places where you can rock your NYE 2019! 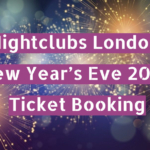 New Year’s Eve 2019 ticket booking of nightclubs London is ON! Book Now! 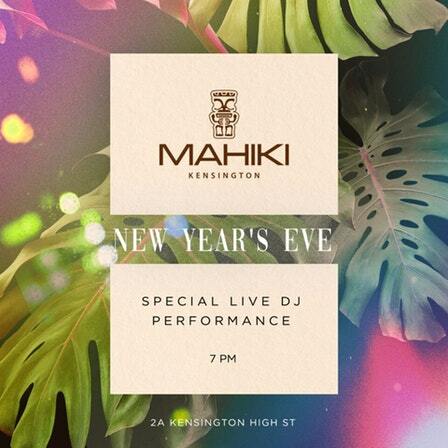 Mahiki Kensington London New Year’s Eve 2019 ticket booking is on! London city’s honored founders of Mahiki, Piers Adam and David Phelps teamed up with the creators of South Kensington private members’ club Albert’s — Carlo Carello, Jake Parkinson-Smith and Fraser Carruthers. To bring the newly created Tiki paradise to Kensington. This, London’s posh nightlife hotspot’s décor is like medieval suits of armor, contemporary light fixtures, and neon signs, creating a whimsical yet ultra-modern vibe. Mahiki Kensington club London celebrates traditional Polynesian style and encapsulates the spirit of Tiki, offering you an unforgettable experience. Renowned for producing incredibly luxurious NYE celebrations, New Year’s Eve 2019 Mahiki Kensington is going to blow the minds! Join us in London at your New Year’s Eve 2019 in the most stylish ambiance. The Mahiki club London New Year’s Eve tickets 2019 are almost sold, so don’t miss them out! At New Year’s Eve 2019, you’ll not need to leave London to escape to an exotic destination! Mahiki Mayfair club London has been planning, they’re going to make this NYE 2019 a blast that will take over the whole city! An incredibly marvelous yet thoroughly London New Year’s party at the legendary Mahiki in Mayfair. London Mahiki Mayfair New Year’s Eve Ticket Booking 2019 is almost closed, don’t miss London city’s best experience. The most wonderful ambiance with festive tiki-themed décor and a reputation for high-energy, star-studded nightlife, Mahiki is the escape for the ultimate New Year’s Eve in London. 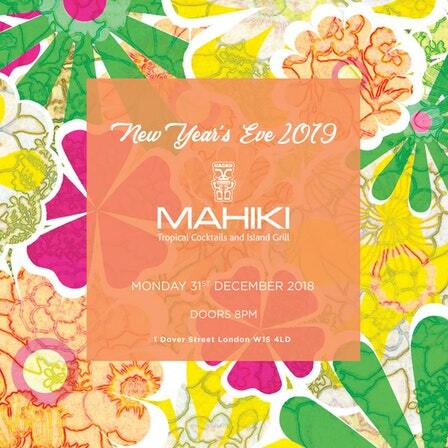 Mahiki Mayfair London New Year’s Eve tickets 2019 are almost all sold out, hurry before you miss it out! At London’s Mahiki Mayfair, the NYE 2019 party is the sizzling antidote to cure your winter blues. The DJ performing live, an of open format Top 40, old-school classics, and mash-ups, tiki-fuelled revelers will find their groove on the dance floor. When it’s midnight, the DJ will lead the crowd in an explosive live countdown to the excellent New Year, complete with a complimentary champagne toast. So? What are you waiting for! Book Now! It’s on! The Cirque le Soir London New Year’s Eve ticket booking. The Cirque club London is one of the most unique and exclusive nightclubs, famed in London city. Bringing outrageous parties and crazy acts, constructing an astounding ambience that just brings surprises to the lovely guests and puts them on their toes. Starring professional acrobats, magicians, hot fire eaters and explicit dancers, Cirque brings a mix of circus and nightclub. 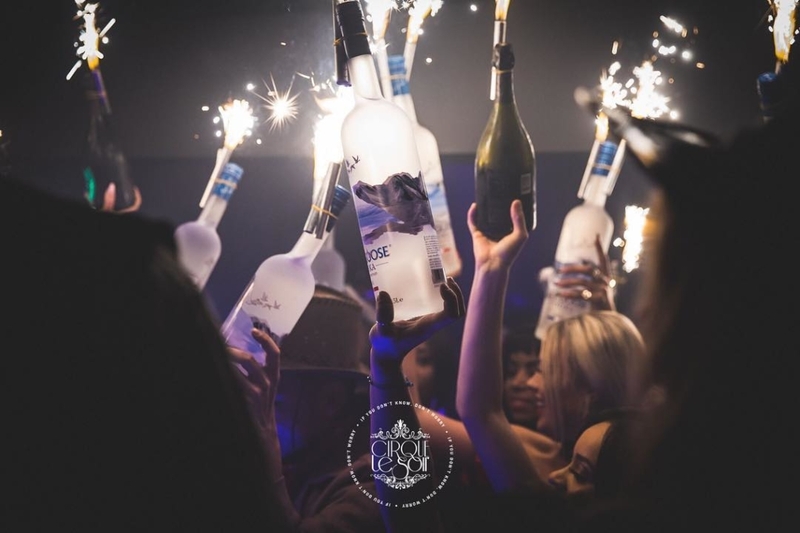 With a lovely list of VIP Guests at Cirque le Soir, Cirque loves and praises its celebrities and Cirque London is loved by them. World-class celebrities like Rihanna, Drake, Usain bolt and Leonardo DiCaprio have liked the taste of Cirque le Soir. For an outstanding clubbing experience, table booking is recommended. Heavy male entourages are not allowed, intoxicated people and casual dressing not recommended! Lux tickets London is going to let you usher in the New Year amid vibrant fun and unstoppable revelry at London’s Black’s Club. The only hotspot in London city that is delivering one fantastic NYE bash. 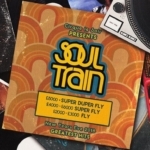 At Blacks Club, the live DJ will be supplying a super-hot soundtrack of Top 40, Hip Hop, House, Dance, and Mash Ups so you can get down on the dance floor well past midnight. The London Blacks Club New Year’s Eve 2019 Ticket Booking is going on right now! Just a perfect place with great food, so perfectly executed cocktails and what’s more important is that it provides a peaceful and laid-back space. Blacks Day ambiance is just full of bliss, you’re going to fall in love with Blacks nightclub London. 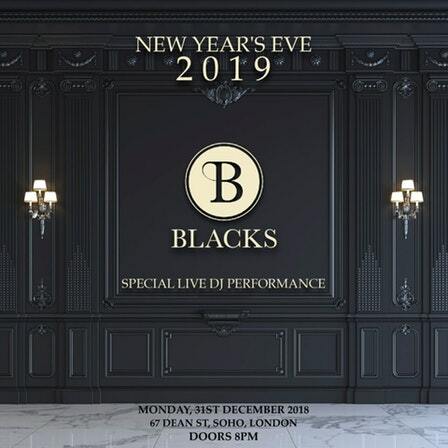 New Year’s Eve 2019 at Blacks Club London is no time will be here and when that magic moment arrives, grab a complimentary glass of champagne and join the crowd as you count down the final moments of the year! Book Now! It’s time to raise your glass and toast to an excellent New Year with the most amazing crowd of London! Pulling out all the stops for London’s nightlife, sophisticates this NYE, the London Karma Soho hosts a chic New Year’s party in the West End. Hey, the Karma Sanctum Soho New Year’s Eve Ticket Booking is going to be closed soon! The London Karma Group brings you the Sanctum Soho, a luxury boutique hotel with a rock n’ roll edge for a cool and classy NYE 2019. The NYE party 2019 at London’s Sanctum Soho is your ticket to a night of luxury revelry with a touch of rock n’ roll glam. Karma group invites you to enjoy top party amenities, a 4-hour cash bar, and a live DJ spinning an open format selection of Top 40, Hip-Hop, House, and mash-ups. As the midnight approaches, join the DJ in a live countdown to midnight, give a toast with complimentary champagne to an excellent new year! The Karma Sanctum Soho New Year’s Eve Tickets 2019 are available but you’re on the clock. Hurry! 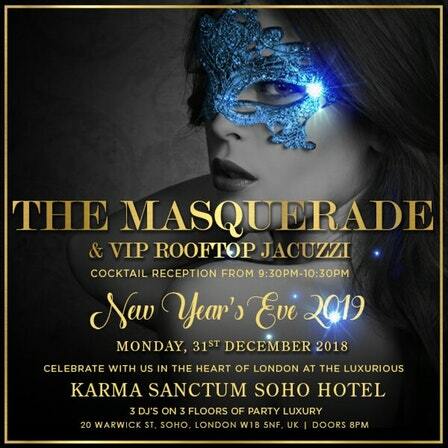 You will be able to choose from a selection of Karma Sanctum Soho New Year’s Eve 2019 VIP packages to access the rooftop and Jacuzzi, reserved seating, bottle service, and more. The Tonteria New Year’s Eve ticket booking 2019 has started already, don’t miss out the craziest night of your life! The NYE 2019 venue at Tonteria will begin at 8:00 PM. Tonteria London club is one of the marvellous exclusive nightclubs, it provides with an exceptional live DJ performance. Tonteria New Year’s Eve 2019 party is going to knock all other NYE parties down! Let us invite you to the New Year’s party amid vibrant fun and irrepressible revelry at London’s Tonteria. On of London city’s hottest places, Tonteria is planning to deliver one fantastic NYE bash. The dress code at New Year’s Eve Festive – Casual Evening / Semi-Formal Attire. Look elegant and 18, of course, they check your ID. Bringing for you the best experience here in a mystifying ambience where you’ll love the live performance of DJ. Tonteria plays a super-hot soundtrack of Top 40, Hip Hop, House, Dance, and Mash Ups. 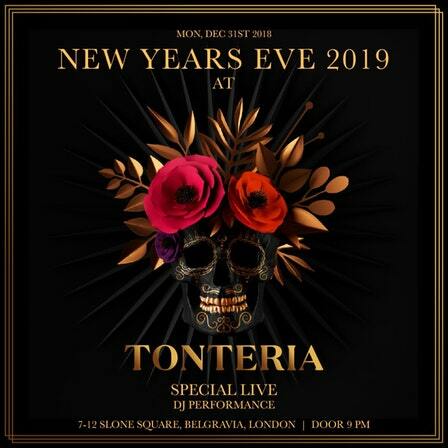 Tonteria New Year’s Eve Tickets 2019 are at their best prices. Don’t miss those good deals out! Book us now!